On September 19th, the Camp Perry Marksmanship Center hosts its annual Open House and Turkey Shoot from 9:00 am through 3:00pm. Visitors can win turkeys in an air rifle prize shoot, try an Army shooting simulator, and even get free hot dogs and beverages. 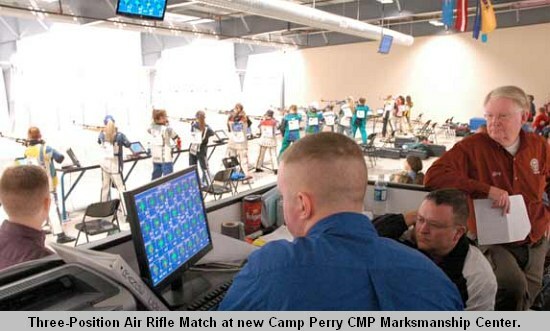 All events will take place indoors at the Camp Perry Marksmanship Center. Jointly sponsored by the Ohio Army National Guard (OHNG), the Civilian Marksmanship Program (CMP) and the Ohio Dept. of Natural Resources, the event is open to the public. Everyone who lives within day-trip distance of Camp Perry is encouraged to “come on down” and try out the center’s electronic targets and have a chance to win a turkey. At the 2008 Open House, over 400 persons participated in the turkey shoot on the 10-meter range and certificates for over 40 turkeys were presented. One lucky participant in each group of ten who shoots the best center-shot on the 10-meter targets will take home a turkey. The Marksmanship Center, completed in the summer of 2008, is a state-of-the-art training facility, ranked as the finest facility of its type in the Western Hemisphere. One part of the center houses a National Guard Engagement Skills Trainer (EST), a simulator that allows Soldiers to train in a controlled indoor environment without the expense of live ammunition. The other part of the Marksmanship Center is an 80-firing point 10-meter air gun range used for Olympic-style shooting events. The 10-meter range features electronic targets that instantly score and plot shot locations on computer monitors next to each shooter. The 10-meter range has already hosted many high profile competitions including the NRA Air Rifle Championship in July. During its first 15 months of operation, the Camp Perry air gun range has hosted 8,000 shooters who have fired 600,000 shots as well as 11,500 visitors. Camp Perry is located approximately 5 miles west of Port Clinton on Ohio State Highway # 2. The Camp Perry entrance is on the north side of Hwy # 2 and is marked by two lighthouses. Proceed north (straight) on the Camp Perry entrance road (Niagara Road). Follow signs to the open house. For more info, call 419-635-2141, ext. 1101 or email shand [at] odcmp.com. CLICK HERE to read more about the CMP Open House/Turkey Shoot. 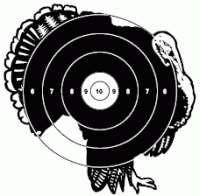 Share the post "Open House and Turkey Shoot at CMP Marksmanship Center"